Acne is a very common skin condition that can cause significant psychological upset. Acne is a condition that requires medical treatment. The right person to advise on the management of acne is a qualified consultant dermatologist who is on the specialist register of the General Medical Council. Acne affects males and females of all races. It is more commonly seen in teenagers and young adults, with 85% of 16-18 year olds affected. However it does occur in children and frequently in adults of all ages. Acne is characterised by comedones (blackheads and whiteheads) and pus-filled spots (pustules). It usually starts at puberty and varies in severity from a few spots on the face, back and chest, which most adolescents will have at some time, to a more serious problem that may be embarrassing, sap self-confidence and cause scarring. The first sign of acne is usually an increase in oil on the surface of the skin. This occurs due to over production of oil from the oily glands (sebaceous glands) in the skin. At the same time, the dead skin cells lining the pores are not shed properly and clog up the follicles. forming dilated open pores, blackheads and whiteheads ( when the oil clogs the pore under the skin). The sebaceous (oil-producing) glands of people who get acne are particularly sensitive to normal blood levels of a hormone called testosterone, which is present in both men and women. There is also emerging research that shows that inflammation and stress also have an effect on oil production from the oil glands. There is also a strong genetic link to developing acne. Dr Clayton has recruited 186 patients into a national study looking at the genetics of acne. Recent studies have shown that if acne is not treated adequately in the first few months then the risks of permanent scarring is significnatly increased. Dr Clayton has a special clinical interest in both acne and rosacea and he has agreed to be part of a team of experts developing national acne guidelines. He has been involved in a number of trials for new acne drugs. Recent research has indicated that inflammation plays a key role in the development of acne and it is likely that new biologic drugs will be developed specifically to target this inflammation. Dr Clayton received specialist training in acne at the Leeds Centre for Dermatology. He reviews adults and children with acne in his NHS acne clinic at Salford and has also established the “Manchester Acne-Rosacea Clinic” at 76 King Street in Manchester city centre. For the majority it tends to resolve by the late teens or early twenties but can persist for longer in some people. Acne can develop for the first time in people in their late twenties or even the thirties. It occasionally occurs in young children. Dr Clayton can advise on the best treatment for Acne. He does not adapt a one-size fits all for treating his patients who suffer from acne. By undertaking a careful history and examination of the skin Dr Clayton can advise on what the treatment options are. He listen’s to his patients carefully and devises a management plan that is tailor made to each individual. Dr Clayton regularly lectures GP’s and consultants on the management and new treatments for acne and rosacea. He also runs an annual course aimed at clinical assistants in dermatology. 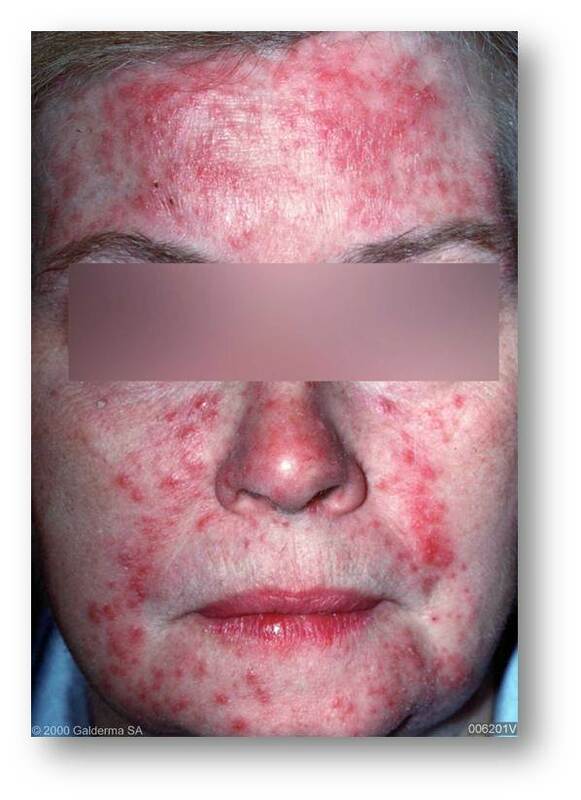 Rosacea is another common skin condition that is poorly understood. It typically causes redness on the cheeks and nose, with flushing. 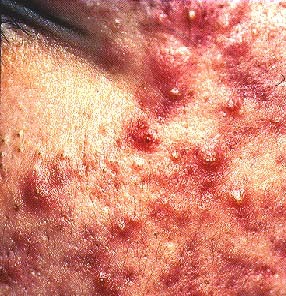 Spots and pimples are often found. New research has confirmed that rosacea may be due to abnormalities of the innate immune system and this helps to explain why antibiotics such as doxycyline in low dose result in significant improvements in rosacea when taken for several months. Topical immunomodulators such as pimecrolimus cream may also help. A new preparation “mirvaso” has revolutionised the treatment of the redness associated with rosacea. It is only available currently on private prescription. 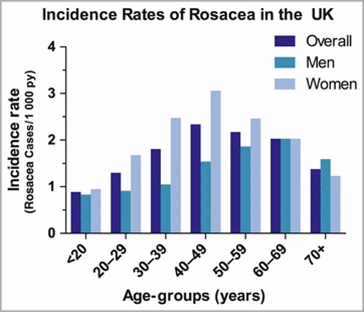 Rosacea is a chronic inflammatory cutaneous disorder, primarily affecting the central face (cheeks, chin, nose and central forehead) and characterised by remissions and exacerbations with a spectrum of overlapping cutaneous symptoms. There are several subtypes of rosacea including occular rosacea which may be the only initial sign of the condition. It often cause very sore gritty red eyes. New treatments for roscaea have recently been developed and are currently being trialled. Dr Clayton has recently provided an update on the treatment of rosacea at a clinical meeting in Lancaster.